With school out, I figured it was a perfect evening to take Sydney to a rock show with me. 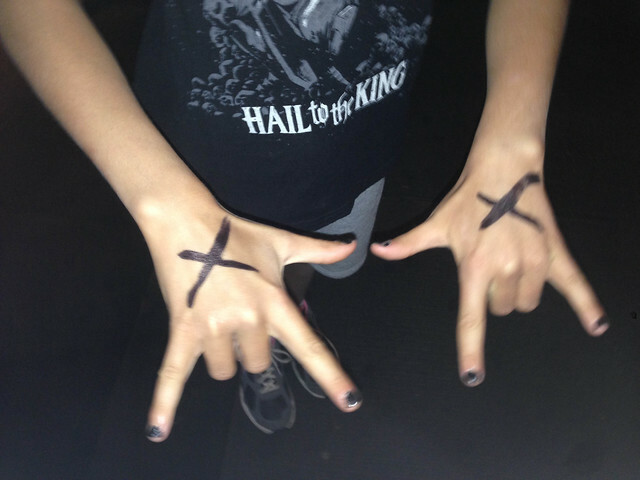 We got lucky because most indoor venues don’t allow anyone under 16 into shows. However, Summit Music Hall is all ages by design and that makes it a great place to see a smaller show for budding rock kids. 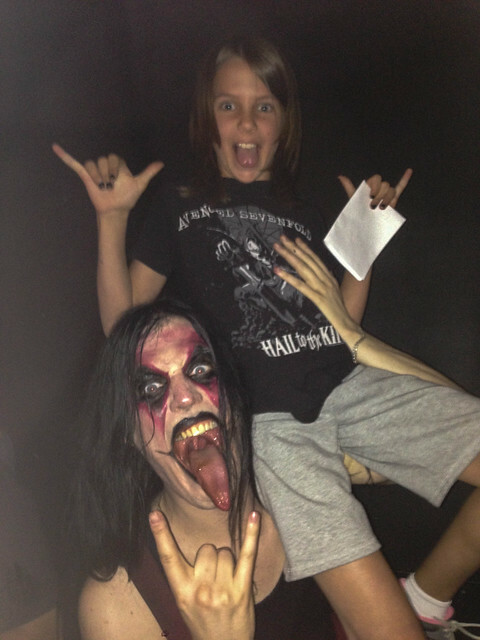 I have been there before and seen a few young rockers in the crowd and I figured I would join them with my kids one day. 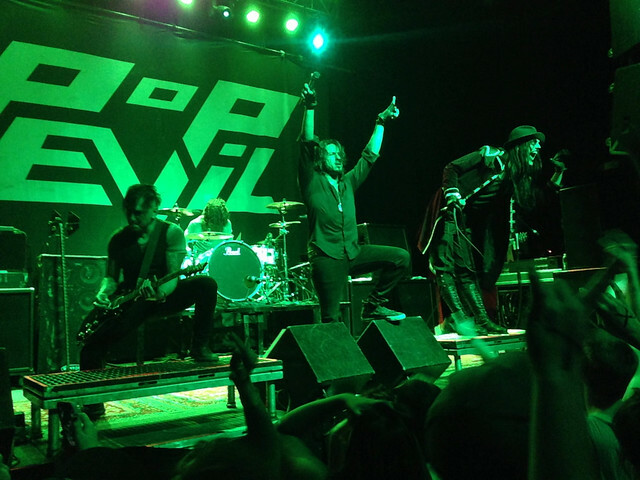 Well, when I saw Pop Evil show up on the calendar, I knew that was the opportunity. Sydney sings 3 of there songs from memory. Let’s go! Well, there were 4 bands on the bill tonight so we had a bit of a wait before our main attraction. I should have gotten her there later for more stamina but she was doing fine. We kept busy checking out t-shirts and other nonsense in the between sets. She got her hands marked too. I think she felt cool. The staff treated her like she was a big deal. Frankly, everyone did. The 2nd band was Avatar from Sweden. The lead singer came out with his face all painted. His tongue was long and he kept sticking it out ala Gene Simmons. I enjoy a performance. Sydney kept saying he was creepy. Well, when the set was done, he came to the merch table which was right where we were. I told her this was her time. Get a photo! She wasn’t too sure. “Sydney, do you want to spend your life posting cat pictures on Instagram or do you want to have something awesome on there?”, I said. She got in line. As I figured, the guy was a total marshmallow when we got up there. He had this Swedish accent and politely asked her about the show and what she wanted him to do. He offered to pick her up for maximum scary and she went with it. The result! And an autograph. 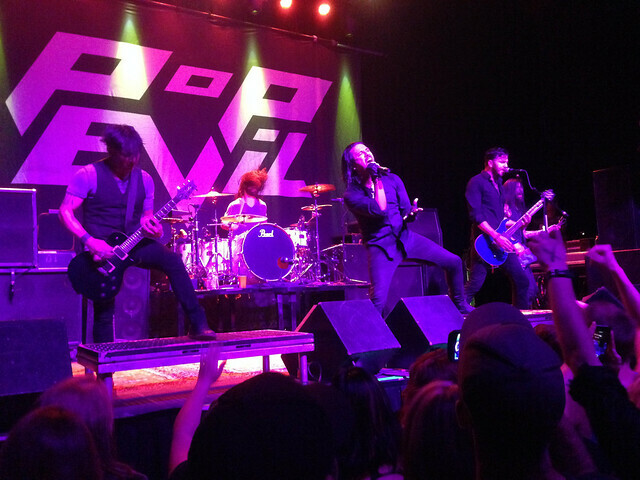 Finally time for Pop Evil so we made a beeline up to the front of the floor. I scoped out a great spot behind a section of shorter women. Sydney was 3-4 people back and could see perfectly. Everyone around her kept asking her age, complimenting her on her shirt, and more. She was often asked, “Is that your brother you are with?”. “Nope, my Dad”, she would say. “Dude, you are the coolest Dad ever”, I was then told. Hey now. 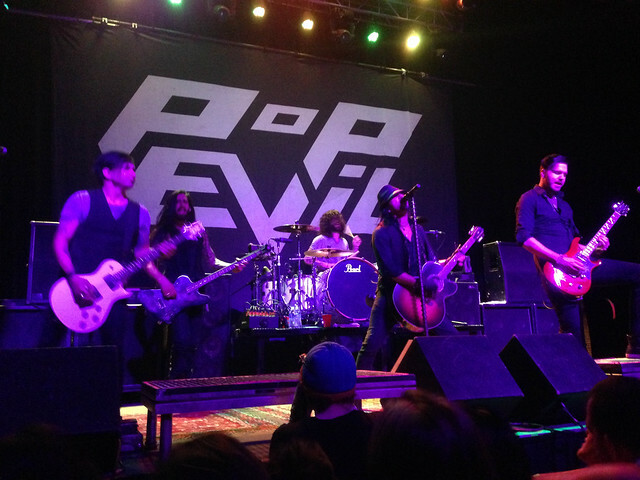 Pop Evil was on fire as this was the final show of the tour they said. They even had our Swedish friend come out for a song. It was kind of cool since we had just met him an hour ago. I had prepped Sydney on the songs in advance so she knew everything that was coming at us. Pretty good experience when you know all the band’s music. They played all her favorites too so I knew it would be a good show for her. When they finished, we didn’t get any goods the band was throwing into the crowd. Drat. But a lady turned to Sydney and handed her a signed guitar pick that she just caught. Great souvenir and what a nice gesture. We got out of the show around 11:30 and headed home. Sydney crashed out in the car halfway home. For most of the last decade, parenting has been about the routine things — go to school, do your homework, brush your teeth, be nice to people, get to bed, and such. But as the kids get older, you get more chances if you dare to put your kids in situations that you actually get to mutually enjoy. Skiing with my kids was one such on the athletic side. While some adults fear it, my kids and I have a blast barreling down a run together. This concert was no different. 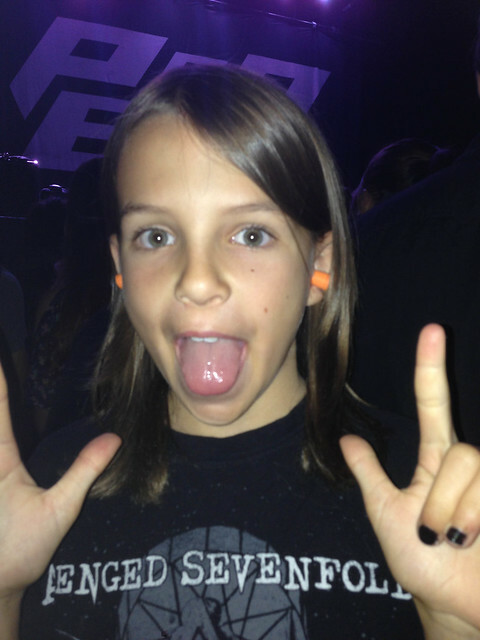 Sydney likes her Katy Perry but she can just as easily rock out to Pop Evil. We can share an evening together doing something memorable together. Not staring at our phones. Not discussing the straight As she just got on her final report card. Not worrying about the routine things for a few hours. And hopefully building a deeper friendship that will last forever. On the surface, I am sure people judge rock concerts, people with tattoos and piercings, scary guys with face paint, and passionate lyrics all too much. Deep down, its just a performance. We just tend to like it a little more heavy and less normal. And the sooner Sydney and anybody else realizes that, the sooner they will be free to live life without being so judgmental of others and being afraid of something different.